It's been quite the reversal for the Seattle-area rental market, where rent growth has been near the bottom of the country in 2018 following years of rent hikes that were among the nation's largest. Now, landlords have responded by giving out perks to lure renters. It’s getting easier to find an apartment to rent, and in some neighborhoods it’s even getting cheaper. 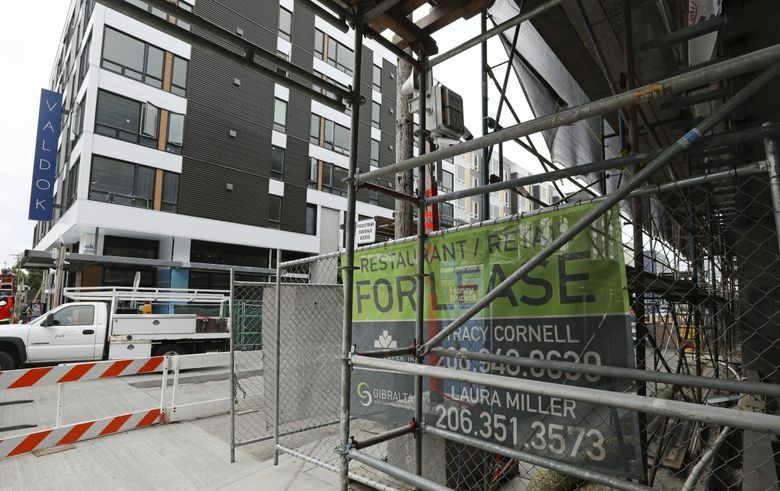 Seattle-area renters are enjoying the least competitive market since the recession as more and more apartments sit empty and rents have flatlined — a trend that is likely to continue as the ongoing apartment-construction spree delivers an even higher number of new units in 2019. Rents across the city of Seattle ticked up a mere 1.1 percent in the third quarter compared with a year ago, the smallest bump since the housing bust was in full swing in 2010, according to a new quarterly landlord survey from RealData/Apartment Insights. It’s a similar picture on the Eastside, where rents are up 2 percent in the past year. The priciest neighborhoods getting the most new apartments — downtown Seattle, Belltown and South Lake Union — actually saw rents decline over the past year. The University District also saw rents dip, as did Sammamish-Issaquah. Things are still a bit more competitive in the cheapest parts of the region: Rents grew 3.9 percent in South King County and 3.6 percent in Snohomish County, year-over-year. Slow rent growth is a national trend. But Seattle’s turnaround — from one of the hottest rental markets in the country for much of the past half-decade to one of the coolest now — is more dramatic than other cities because a historic number of apartments are opening. The Seattle area is building the fifth-most apartments of any metro area in the nation right now, and the four regions building more — Dallas, Los Angeles, New York and Washington, D.C. — are all significantly larger, according to RealPage. Only Dallas appears to be building more than Seattle on a per-capita basis. The city of Seattle has set annual records for apartment openings in recent years, though construction has lagged behind historical norms in the suburbs. King and Snohomish counties are on pace to see 13,700 apartments open next year, the most of the current cycle, RealPage data shows. That would push the total number of new units this decade past 80,000 — the most of any decade in history, beating out the suburban-led building boom of the 1980s. The effect of the new apartment openings has already been significant. When looking at all apartments in the region, including new ones still in lease-up, 7.7 percent of units are sitting empty, the highest rate since 2010, and up from 6.4 percent a year prior. The downtown Seattle core, which had an eye-popping 25.7 percent of all apartments empty in the spring, has since recovered a bit as the newer buildings start to fill up, but it still leads the region with 17.4 percent of units vacant. More than 10 percent of units are empty in East Bellevue, Bothell, the Shoreline area, Ballard, South Seattle, First Hill, Sammamish-Issaquah, South Lake Union, Queen Anne/Magnolia and Tukwila. Landlords have responded by giving out a free month’s rent, parking on the house, and electronics or gift cards to lure tenants. Those concessions are now worth $300 on average over the course of a 12-month lease, up from just $24 a year ago, according to Apartment Insights/RealData. Derek Lunde, senior marketing director and partner at Seattle-based Red Propeller, which advises developers on how to fill up their apartments, says renters are shopping around. Some are even filling out spreadsheets with vital stats — rents, square footage, amenities, etc. — on the various new buildings and using the data to their advantage. For the other main type of renter, where cost is less of an issue, they are looking for the best building in their preferred neighborhood. Years ago, Seattle landlords could simply open the doors and watch renters rush in, but now it’s about “how can you out-glitz and -glamour the next one,” Lunde said. The building boom is likely to let up as projects underway now get completed, however. Dan Lessor, director of real-estate development for Mortenson Construction, said the cooling rental market, combined with rising construction costs, have made it harder for developers to get new projects off the ground. Already, a wave of projects have switched from rental apartments to for-sale condos in recent months. Obviously the positive news for renters is of little comfort to those who have already been priced out of the area. Seattle remains one of the most expensive places to live in the country, with rents across the region having soared 69 percent so far this decade, adding $710 to the average renter’s monthly bill. The average rent across all unit types in the third quarter reached to $1,945 in Seattle and $1,970 on the Eastside. Even the more affordable parts of the region aren’t cheap: Rents cost $1,515 in Snohomish County and $1,450 in South King County, both above the national average. Where is it still a landlord’s market? That would be in Burien, central Everett and northeast Snohomish County, where rents grew more than 7 percent in the past year. Rent growth was about 5 percent — a bit more than the local median income increase — in Des Moines, south Everett, Kent, the southeast corner of King County, West Seattle and Tukwila. All of those areas have rents below the regional average. The most intriguing area might be South Lake Union, which has more than doubled its apartment stock in the last five years as developers look to strike gold in a neighborhood completely transformed by Amazon. The picture so far is mixed: Rents there now sit at $2,200, the third-priciest in the region, behind downtown Seattle and West Bellevue, and units there are filling up faster than just about anywhere. Still, rents in South Lake Union declined 2.7 percent in the past year, the biggest drop in the region, as the the flood of new units has completely outpaced the market. Read the latest stories on real estate here.